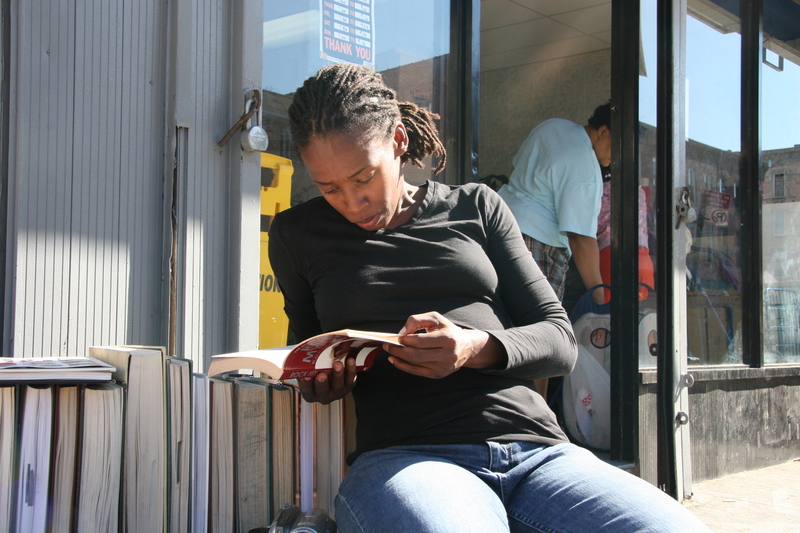 Consistent with the themes of her larger body of work, which investigate literacy as something various and plural (from food literacy to street literacy to the literacy of language), Stephanie’s 2007 Create Change project placed books at its center. In addition to a free “bring one/take one” community book exchange, Stephanie built a bench made out of books that served as a stage for a public performance in which she quite literally sat and read. In the context of her Bed-Stuy neighborhood where the library had been closed for more than a year, there is only one bookstore for miles (versus the bounty of bodegas, and liquor stores), and those privileged enough to spend time in cafes quite often do so with computers and ipods in tow…the act of reading was quite possibly revolutionary. Stephanie Dinkins is an interdisciplinary artist who merges video and sound with an array of organic and found materials to create sculptures and installations. She has recently completed public art works for Jamaica Flux 2007 and The Laundromat Project. Her work can currently be seen in Cinema Remixed and Reloaded: Black Women Artists and the Moving Image Since 1970, Spelman College Museum of Fine Arts through March 2008 in and has been featured in Survive/Thrive/Alive, Wave Hill, NY, Artificial Africa, Gigantic Art Space, NY; Afrofutrism, SoapFactory, Minnesota, MN; Veni Vidi Video II, Studio Museum in Harlem, NY, Socle du Monde Biennial, Herning Kunstmuseum, Denmark. She earned an MFA from the Maryland Institute College of Art and is an alumna of the Independent Studies Program of the Whitney Museum of American Art and Artist in the Marketplace Program of the Bronx Museum of Art. The recipient of grants from the Puffin Foundation, the Trust for Mutual Understanding, the Lef Foundation and Philip Morris, she lives and works in New York.